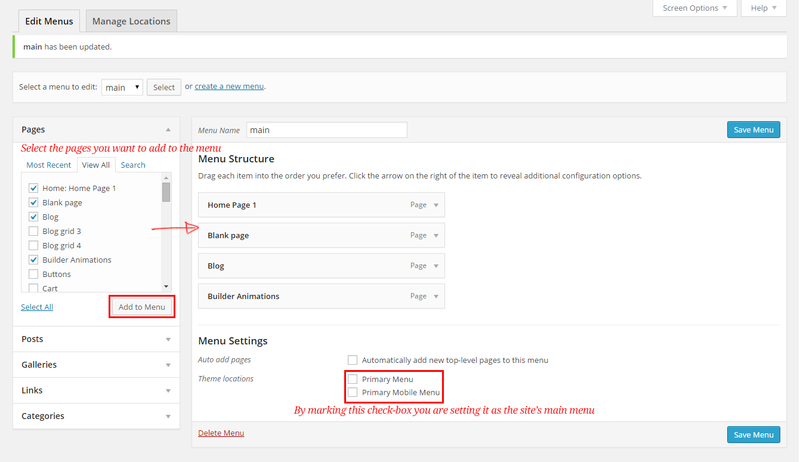 In the following guide we’ll explain how to manage your WordPress site menus. 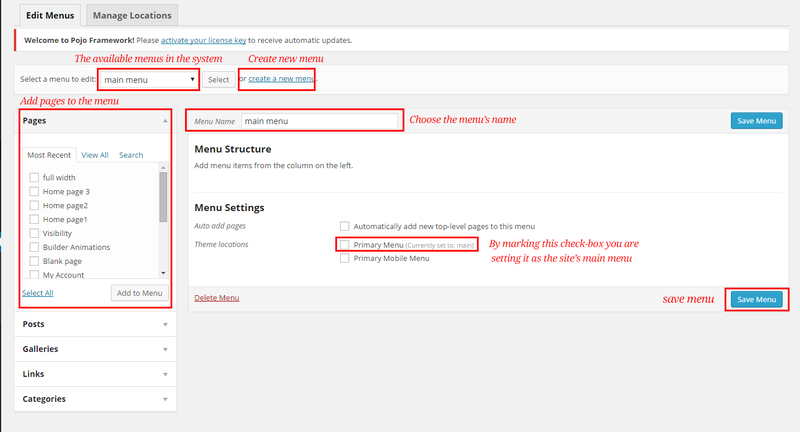 Choose the menu that you would like to edit, if you hadn’t create a menu yet click “Create New Menu”. 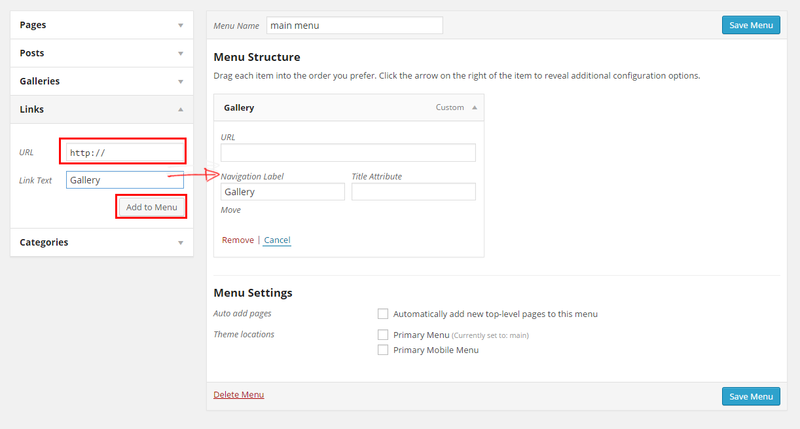 If you’ve opened a new menu set its name in the “Menu Name” field. 3. Select the columns you want to add to the menu (in this window appear all the pages that were published in the site) and click “Add to the Menu”. If you want to set this menu as the site’s main menu (that will appear at the top of the site) mark the “Main Menu” option at the bottom of the left panel. 4. On the side of every page you added to the menu (shown in the left panel in the form of a gray rectangle with the name of the page) is a small arrow. Clicking on the arrow will open a few options: Rename the page as will appear on the menu (eg, the page’s name is About and you want that in the menu it will be Who We Are). At the bottom of the panel is a Remove button – a click on it will delete the page from the menu. 5. If you want to create a drop down menu, all you have to do is drag the row under the row you want it to appear below, notice that the page you set as the sub item will appear indented to the right of the row above it. This can be set for sub page as well as sub sub-pages (3 levels). 6. If you want to make a drop down menu but that the top button will not be clickable but will only open the sub menu, all you need to do is add a link (custom), and in the llink field insert a # and name the item in its relevant name, and then add sub items below it. You can edit the main item and erased the #, so the button will not be linked at all. 7. 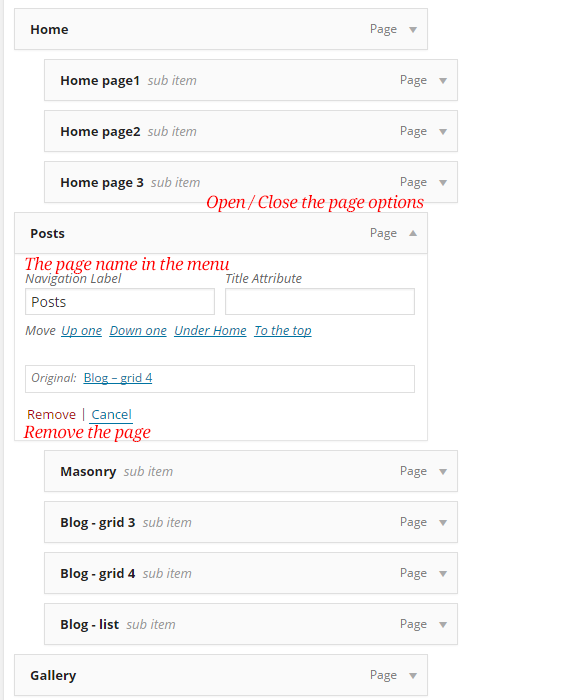 In many cases you’ll want to set the menu that it will open in a new tab, or add direct links to posts or other CPT. Notice the button “View Options” that allows you to add various elements to the page. 8. Do not forget to click the Save button to save your changes on the menu.